I have really been enjoying the Action Figures universe so far, so I was really looking forward to this new Issue. But to be honest, I was blown away at what I experienced in this book. I use the term 'experienced' on purpose, because I didn't quite *read* this book, but I felt connected very much with it, on an emotional level.Issue Four: Cruel Summer is a bit darker than the previous three books, and really explores the characters and what happens and can happen in a person's life, not to mention what a superhero goes through and the craziness that entails. I really can't heap enough praise on this book because it was a great read, and made me laugh, cry, smile, then get angry at characters in turn. It's a rare book that not only entertains, but connects on that more visceral level. This was one of those books for me. The Action Figures series gets better with each installment, and this is no exception. There's a seriously creepy villain here, and the Hero Squad is badly shaken by the experiences that come with facing him.But the real meat of this book isn't even about the superhero business. Bailey tangles with an ambitious range of life's most intense experiences here—death, powerlessness, alienation, prejudice, sexual awakening, and more—and each is handled with honesty. The depiction of bereavement is among the best I've ever seen. And the supervillain's influence threads through these experiences, amplifying and complicating them, rather than taking over the focus. I look forward to seeing what's coming next. Wow, this was intense! I can't say much about it without spoiling it, but a lot of disasters and miseries hit the team at once. The author deals sensitively with a number of difficult subjects, to the point where I want my daughters to read certain bits of it (well, okay, one daughter has already read the book twice, but the other one....) I hope he writes more -- he can't leave it here! This was good, in parts very good. Much darker and more realistic than the chewing gum level of the previous books. All the way around it is a more inclusive, diverse and mature (but still YA) book. 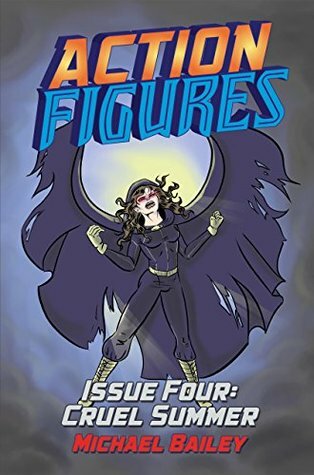 Over the course of the Action Figures series - which I have devoured with an enthusiasm that I've not seen in myself in a long time - I have come to love the character of Carrie Hauser, and that love is spread equally among her fellow teenage superhero friends Sara, Matt, Missy and Stuart. I've watched them grow as friends, as superheroes, and as people. They've faced super-baddies, and they've faced demons (actual demons). But they've also faced their own demons, which are perhaps the scariest things of all.Never once does Michael Bailey let us forget that, underneath the costumes and funky superpowers, these characters are just people: flawed, emotional, judgmental, and decidedly unsuperheroic when the costumes come off. Trying to balance two lives is a dicey thing at best, a disastrous thing at worst, and never once has Bailey played this balance off as all fun and games.In Cruel Summer, far and away the darkest book in the series, a supervillain calling himself the King of Pain comes to Kingsport, and he has designs on Sara. Being the target of a murderer is bad enough, but add that to Sara's increasingly volatile relationship with her parents, and you have a recipe for drama that slams the needs all the way to the right. Events transpire that will leave the Hero Squad reeling, and I can only wonder (and hope) that recovery from the trauma heaped on them in this story can be repaired. This roller-coaster of a story had me glued to my Kindle from start to end. I only put it down a few times (to work, and, you know, sleep), and I felt emotionally spent afterwards. When a book does that, it's a credit to its author. And once again, I praise Michael Bailey for taking me on another thrill ride. Michael C. Bailey - Michael Bailey is a professional writer from Falmouth, Massachusetts who kind of hates writing bios.Michael has been a working writer since 1998 when he simultaneously (and at the same time) sold his first freelance article to Renaissance Magazine and landed a job as a staff reporter for the Enterprise Newspapers. Michael recently ended his time at the Enterprise to focus on his creative writing.Over the years Michael has contributed several more articles to Renaissance Magazine and other local publications, and has since 2004 been a staff writer for two New England-based renaissance faire production companies: Pastimes Entertainment and the Connecticut Renaissance Faire.In September 2013, Michael's debut novel "Action Figures" became available on .